It Won’t Come Back Void! I love this verse! It reminds me of the power of God’s Word whenever His truth is shared! It will not ever come back void. There’s always purpose! There’s eternal value in sharing His powerful truth! The other day my friend Jade and I were talking about this verse and she shared that God not only uses His Word in others’ lives when we share it, but in our own lives as well. Many times the message we are sharing is the very lesson God is using to bring forth fruit in our own lives. There’s incredible power in God’s Word. It’s a book worth reading, memorizing, meditating on, doing, and sharing. The more we read, soak it up, apply it, and send it out, the more it will produce fruit in our lives and in the lives of others. 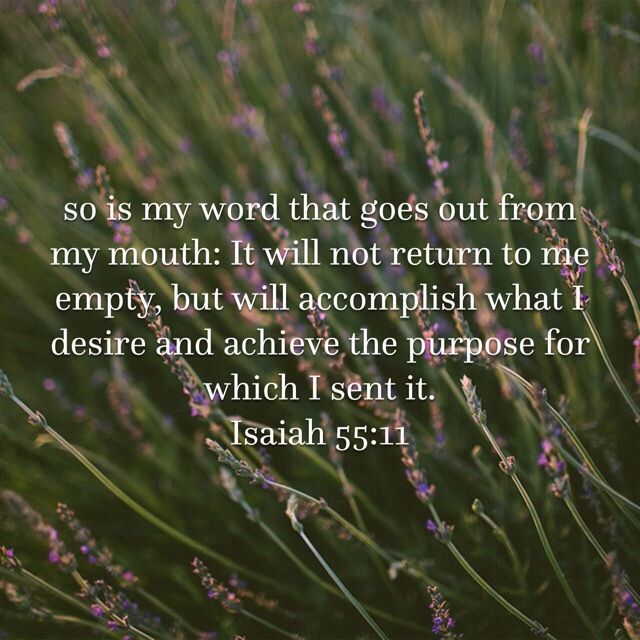 Of this we can be sure…His Word won’t go out and come back void! Thank You for that Word!! !